Cornwall's planners have given the go-ahead to a company which wants to re-start tin mining in the county. A planning meeting has approved environmental conditions for mining operations at Pool, near Redruth. BaseResult Holdings Limited bought the disused site in 2001 with the intention of restoring it and creating jobs. BaseResult said it was hopeful that South Crofty would start mining tin at a profit within two-and-a-half years, and that 200 jobs would be created. 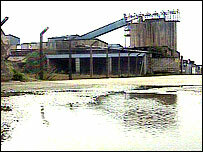 South Crofty closed as a commercial concern in 1998, bringing a 3,000-year-old tin mining tradition in Cornwall to an end. Since then, its future has been uncertain. Even the Camborne, Pool and Redruth Urban Regeneration Company suggested tin mining was not the sort of industry a modern county needed. But planners have finally approved the environmental conditions the mine will be operated under, which Baseresult said was one of the last things it was waiting for before starting its operations. Kevin Williams of BaseResult Ltd said: "This is one of the reasons that we've been delayed all the time. "We've always said it would take two years to get working, and we now believe it will be because these issues are now out of the way." But former miner and county councillor Mark Kaczmarek said there were still some concerns about the mine restarting. He said: "To bring the mine back into production you've got to build a completely new mill and a water treatment works. It's going to cost at least £30m. "That's a lot of money before you mine one ounce of tin. I don't believe BaseResult have got the muscle and financial backing to plough that amount of money into it." The company says its plans for housing and other surface developments will be secondary to a full-scale mining operations. When the mine closed, it was producing a relatively small 2,100 tonnes of tin per year.